TUCSON, Ariz. - To keep kids well fed, a lot of families depend on school breakfast and lunch programs, but what do they do when school's out? Some of them go to the library. 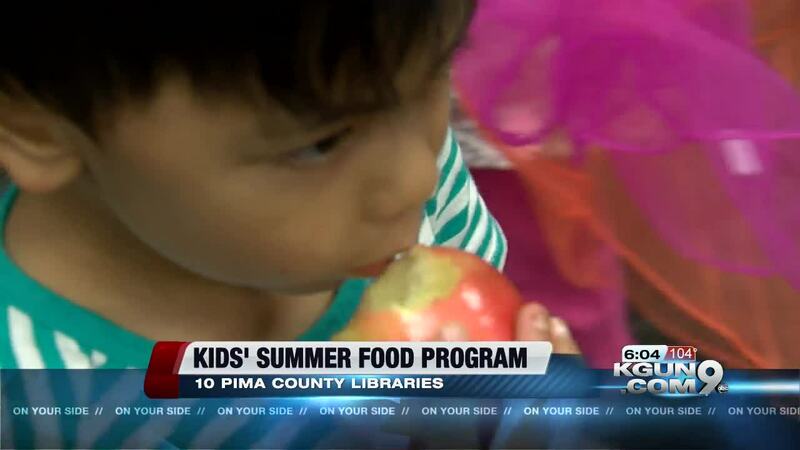 Libraries are certainly all about books but more and more they are becoming general neighborhood resource centers and in the case of Pima County libraries , a lot of them, throughout the summer are a place for kids, to get meals. Kids need food to fuel all their energy but when school's out that food will not come from the free and reduced cost programs many children can tap into at school. But they can get a snack at ten Pima County Libraries. You can see the list here . We saw the program in action at the Valencia Road Branch at 202 W. Valencia Road. Symantha Espinoza is a mother who says, “This is our first time but just hearing there was free breakfast, an apple and snacks was just ...We were really grateful mainly because it's hard to supplement the snacks all the time and so I did feed them this morning but to have this available for them to give them the energy was a big blessing." The Community Food Bank of Southern Arizona manages the program. A grant from Albertson's covers the costs. For the libraries, helping to feed kids, fits the library mission to feed minds. Mother Violet Lurigio says, "I thought it was amazing. I was like, oh that's really nice because there is a lot of children that don't receive breakfast and I didn't even know about it until I walked in so." And unlike the schools this food program does not require families to prove they are low income to qualify.